Rev. 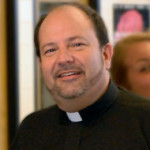 Francis DesLauriers, CSV, 67, assistant pastor at St. Viator Church in Chicago, died suddenly Tuesday evening, February 16, 1971 at 11:30 PM in Presbyterian-St. Luke’s Hospital. Francis DesLauriers pronounced first vows on September 12, 1930. He was ordained to the priesthood on February 10, 1938 by Bishop John McNamara in the crypt of the National Shrine of the Immaculate Conception in Washington DC. DesLauriers’ first assignment, in 1938, was at St. Thomas School in Savannah, Georgia. Then, in 1939, he served as assistant at St. Michael’s Church in Gainesville, Georgia. From 1940 – 1948, DesLauriers served as Director of Scholastics for at St. Ambrose College in Davenport, Iowa where the Viatorians studied. In 1948, he became the Novice Master at the novitiate on Sheridan Road in Chicago. Fr. DesLauriers’ next assignment in 1951 took him to Cathedral Boys High School in Springfield, Illinois where he served as treasurer. During his 13 year tenure there, he saw the building of the new school, Griffin High School, in 1959. In 1961, the graduating class dedicated their yearbook to him as “one who is truly a friend of all – a grand priest.” Due to poor health, he was assigned in 1964 as spiritual director and confessor for the scholastics back in Chicago – a less demanding work. His last assignment was at St. Viator Parish in Chicago in January of 1968. 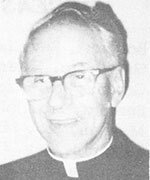 A vigil was held at Theis Funeral Home at 8 pm on Friday February 19, 1971 with Father Gerald Leahy, CSV, giving the homily. A Mass of Requiem was concelebrated by Fathers Edward Anderson, John Brown, Joseph Canella and Leo Weiland at St. Viator Church at 11 AM on Saturday February 20, 1971. Father Canella delivered the homily and Bishop Nevin Hayes, O.Carm., Auxiliary Bishop of Chicago, gave the Final Commendation. Burial was at Queen of Heaven Cemetery, Hillside, Illinois. Survivors include three sisters, Mrs. Dorothy Enos, Mrs. Lucille Sublett and Mrs. Irene Madison and five brothers, Richard, Alfred, Edward, Eugene and William. Taken from Provincial Residence Newsletter #467, February 21, 1971, newspaper clipping (source and date unknown) and biography written by Br. Don Houde, CSV, June 1986.